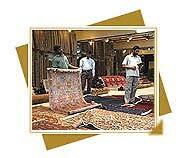 As the name suggests, this method involves two stages: tying sections of a length of cloth (silk or cotton) and then dunking it into vats of color. 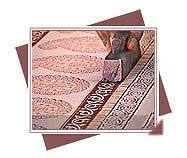 The rainbow-tinged turbans of the Rajputs and the odhnis of their women are shaded by this method of resist dyeing. 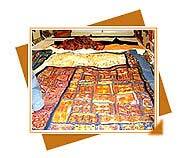 Rajasthan has a long and distinguished traditon of printing with finely carved wooden blocks. This method, though labourious, is actually quite simple and merely calls for precision. The Rajasthani carpet is but a true expression of the workers' simple philosophy, his sensitive perception of nature and its changing moods convincingly translated into the craft. The color combinations are lovely and worksmanship exquisite. In the hamlets of southwestern Rajasthan you won't spot a solitary house without an embroidered toran or frieze hung above the doorway. 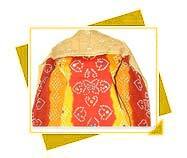 The women of this region and adjoining Kutch and Saurashtra districts of Gujarat are adept at needlework. 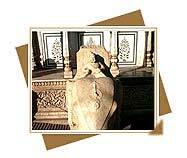 The furniture of Rajasthan is in harmony with its palaces and havelis, displaying similar intricate design and carving. 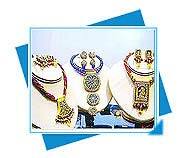 The artistic delicacy and elaborateness in the manufacturing of Rajasthani jewellery made of purest and finest materials is world-renowned. 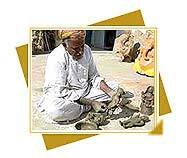 One of the most popular leather articles of Rajasthan is the Mojadi or Jutti - an attractive footwear item. 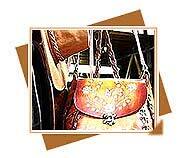 The leather is embroidered, punched, studded and stitched in various eye catching designs. 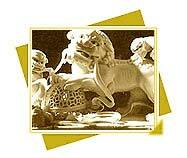 The metalware of Rajasthan comprises of artistic, enamelled and engaved silverware and metalware. Popular creations in silver include wine cups, silver embossed decorative boxes, human figures, cigarette lighter cases and photo farmes. 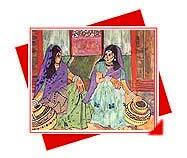 Rajsathan has many schools of painting having their own districts styles, well known among them being Marwar, Mewar, Hadoti Kishangarh, Dhundhur and Alwar. 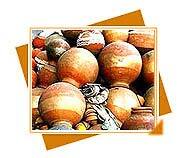 Pottery, one of the old crafts, has its own standing tradition in Rajasthan. 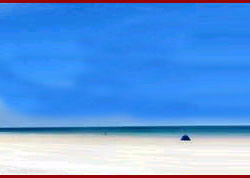 Certain shapes are characteristic of Rajasthan. 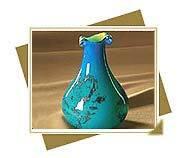 Alwar has been known for its double cutwork pottery known as �kagzi�. 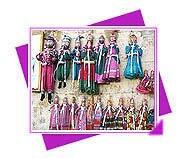 Puppets is an ancient and popular form of folk entertainment. No village fair, no religious festival and no social gathering in Rajasthan can be complete without Puppets. Rajasthan is not merely famous for the valorous deeds and heroic sacrifices of its warriors but also for its splendid architectural monuments made of stone. 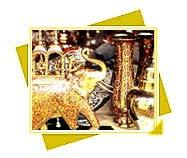 A common sight in the curio and gift shops of Jaipur is boxes, tables and trays with brass or copper inlay work. This type of work is called tarkashi and it utilizes burnished metal wire or tar set in the wood to create delicate arithmetical patterns. Terracotta is an age - old craft of Rajasthan. 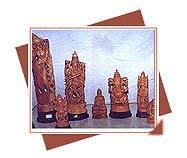 Alwar create paper - thin Kagzi pottery, while white and red clay articles with arithmetical designs are made in Pokaran. 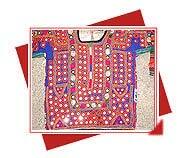 Rajasthani textiles come in a fascinating range of dyed and block-printed fabric which are further embroidered. Each region has its own special color scheme, design and technique. Fragrant and fairly beautiful, sandalwood carvings come in a range of objects and themes-ranging from caravans of tiny camels to decorate a mantelpiece to key chains, paper knives and trinket boxes.